Are you looking to have a Palm Hut built for your home or business? At Florida Tiki Huts we specialize in building some of the best palm huts in the entire state of Florida. Just image that you could bring a piece of tropical paradise to your very own backyard or business establishment. Our authentic custom designed palm huts are a very excellent choice when looking to add the look and feel of an island oasis. 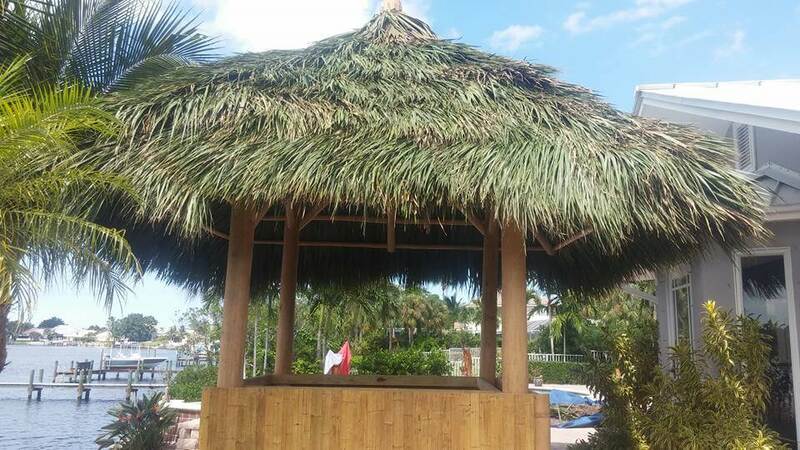 Whether you are looking for a large custom designed palm huts that will cover a large area outside or something more like a pool side style palm hut or maybe something to fit a small outdoor patio area. Offering both luxury and comfort as well as protection from the elements, our palm huts are made from the highest quality cypress trees and sable palms found in the Florida Everglades. Our team of highly qualified palm hut builders are also very highly experienced carpenters in there trade. No matter the complexity of your custom palm hut, you can always expect the highest quality of workmanship with attention to detail in every way imaginable. Our Palm Huts Are Built To Perfection! With over 40 years experience building palm huts throughout the state of Florida we can say with confidence that we build some of the best palm huts in the industry. Proud to be “The Original” Florida Tiki Hut builder, we build our palm huts to the highest standards and are built to perfection.